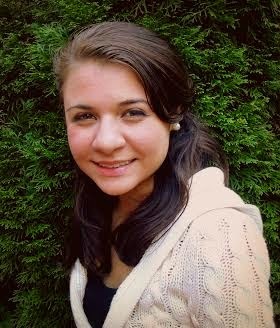 Maria is a senior at Windham High School. She is an active member in the Windham High School community. She was in the fall musical, A Funny Thing Happened on the Way to the Forum, where she acted and was the assistant director. She is also in the One-Act, a theater competition. She is a member of the Windham Chamber Singers and in National Honor Society and Spanish Honor Society. Maria also plays guitar and piano, and takes singing lessons. Her favorite subjects are math and economics, and her favorite teacher in high school was Ms. Hill. She really looks to both her teacher and her parents as role models. She really enjoys Windham High School and wants to thank everyone at the school who has helped her succeed. She likes WHS because of the great atmosphere it provides. Their courses are challenging, but the teachers really want students to succeed and everyone is really friendly. After high school, Maria wants to continue her education by going to college where she would like to study business. She would eventually like to own her own café or bakery, but she is not sure where. Wherever she ends up, we wish Maria luck as she soars into the world! Sabrina Nickerson's fifth-grade class sits with Field-Allen Post Commander Melvin Greenier and Vice Commander Karle Learned. Melvin and Karle were in the classroom to discuss the significance of the Grand Army of the Republic (GAR). Kaila Mank (center) is holding a GAR cemetery marker. 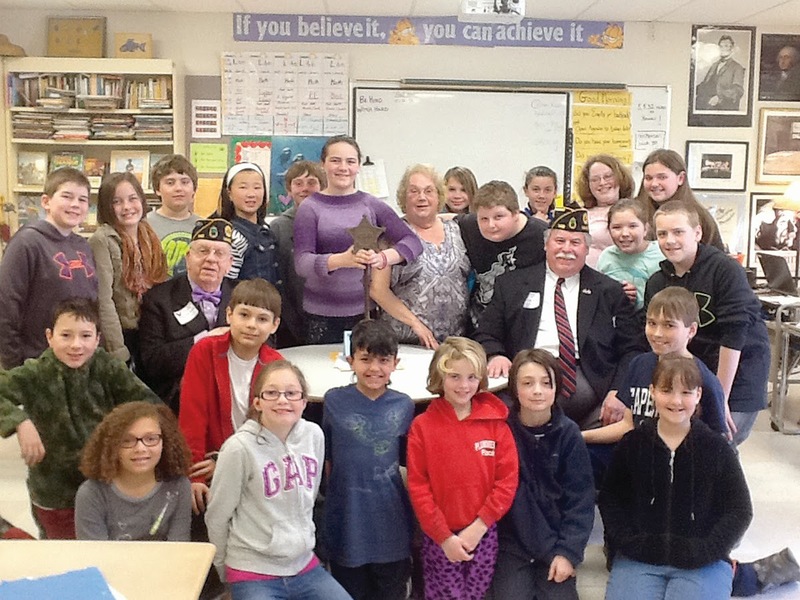 The class has been collecting donations on behalf of the American Legion to support the purchase of replacement GAR markers in the cemeteries in Windham. The class collected over $450 for this purpose and presented the donation to Commander Greenier during Community Day held last week. A total of 58 markers will be replaced this spring during Memorial Day events. Photo by Sabrina Nickerson. According to The Pew Research Center, there is no one thing people want their libraries to be. They want their libraries to be lots of things: A place where they can study, meet with friends, and attend programs and meetings and more. There are common themes, however. Quiet spaces are still an important part of what people expect from their libraries. Another common theme, according to the study, was libraries' role as a community center, and their connection to patrons and other local institutions. So how does a library blend the two? A vision for the future must be formed and each individual library must find the path that best suits their community. One way to begin is to open the library doors wide and welcome the community to a variety of programs and events. On Monday, May 12, at 1 p.m, Jared Leadbetter from the Maine State Library will be at the library with a “Petting Zoo” to demonstrate how to use ebooks. Several ereaders will be available in the library through May 19 on loan from the state library for patrons to try out. Please register by calling the library at 655-4283 or email sally.holt@raymondvillagelibrary.org. Paul Doiron is the author of the Mike Bowditch series of crime novels, including The Poacher’s Son, which won the Barry Award and the Strand Critics Award for Best First Novel. PopMatters named it to its Best Fiction of 2010 list. His next three novels in the series are Trespasser, Bad Little Falls and Massacre Pond. A new title will be released in June. All have been Indie Bestsellers and have been translated into ten languages. Paul will be at the library on Monday, May 12 at 6:30 p.m. A book signing will follow his presentation and copies of his novels will be available for signing. This program is free and open to the public. Please pre-register at the library or calling the library at 655-4283, or emailing sally.holt@raymondvillagelibrary.org. Raymond Village Library’s Plant Sale is June 7 from 7 a.m. to 11 a.m. and the library can use all those extra plants you will be thinning out or removing to make room for new seedlings. By putting aside those plants and bringing them to the library, on June 6, the day before the sale from 4 p.m. to 6 p.m, you will be helping to make this fundraiser a success. Perennials are very popular, as are ground covers, flower shrubs, vines, bedding plants and annuals. For more information, please call Marie at 221-0568, email mkconnolly@maine.rr.com or Jane at 655-5354, email janehubbell@maine.rr.com. Check out the poster on the bulletin board at the library or on the RVL website about the Get Caught Reading Photo Contest. It is open to all ages and there will be prizes! Entries must be submitted on or before May 12. Applications may be obtained on our website or at the front desk. There is a $5 entry fee. Anyone interested in having their garden considered for next year’s tour, please contact Elissa Gifford by phone (207)655-3399 or email ewoodgiff@hotmail.com. All eligible gardens will be visited by the end of June this year and choices will be made by the end of July for inclusion in the 2015 Raymond Village Library Garden Tour, to give owners time to plan and prepare. The first annual Raymond Village Library Bazaar will be held on Saturday, June 21 at the Raymond Village Library from 10 a.m. to 3 p.m. There will be artists and crafters, concessions, a white elephant sale of superior items, music, food and special fun for the kids. Look for more information in the June publication of the Raymond Village Library on our website and Facebook page. The library will now be open four days a week for the convenience of our patrons. Beginning Thursday, May 1 the new hours will be: Sunday – 10 to 4; Monday – 10 to 6; Wednesday - 10 to 6, and Thursday – 2 to 7. The Windham Eagle student of the week is Andrew Gwinn. This 11-year-old from Windham Christian Academy is in sixth grade in Peter Lagasse’s class and has big plans for his life. “When I grow up I want to be a Christian missionary,” Gwinn said. “Besides being an exemplary student, Andrew is a talented clarinet player. He was selected to participate in the 2014 District II Honors music festival. At the festival, he did not hesitate, when asked, to stand up in front of the clarinet section to help with special fingerings. Andrew is a hard worker and a great leader,” said WCA music director Maureen Seavey. His favorite animals are pigs and he loves card games. If he’s not in school, he said he can usually be found on his laptop. Education is important because you learn and get prepared to go out into the world. It begins around late March. The surface is still, a miles long, flat, brilliant white vision, like a very, very large table cloth. The anticipation begins, that anxious waiting. The chat’s between neighbors. When will it be? When will it be? Each day, the studied looks out onto the ice. The dark spots begin to appear like ink stains on a white table cloth. Everyone, starting to watch, as the dark spots grow larger, with the warming Sun. The listening for the moans and cracks as the ice begins to shift. That, oh, so small area, of open water that first appears, then disappears, and then begins to grow larger day by day. That anticipation of once again of seeing and hearing “moving water” on the lake. By the second week of April, the anticipation is almost at a fever pitch. The darks spots are very large with isolated humps of white ice chunks sticking up into the air, like a scene from the Arctic Ocean. There are a few side bets made, between friends on what the date will be. And then suddenly a few windy days and the ice begins to move around in very large sheets. And now a time of anxious concerns. Will it move my way and damage the dock? And then that morning when you look out the window and see all dark blue water with waves and white caps. And as you step out of your home you hear the sounds of the waves washing up onto the beach. The next morning when the water surface is still and is like a miles long mirror, it reflects the colors of the sunrise from the sky. Ah. Spring is here. Sebago Lake is open water, but you don’t want to go swimming quite yet.